Of all the developers’ delight, none is more attractive than a set of APIs that make developers productive, that is easy to use, and that is intuitive and expressive. One of Apache Spark’s appeal to developers has been its easy-to-use APIs, for operating on large datasets, across languages: Scala, Java, Python, and R.
In this blog, I explore three sets of APIs—RDDs, DataFrames, and Datasets—available in Apache Spark 2.2 and beyond; why and when you should use each set; outline their performance and optimization benefits; and enumerate scenarios when to use DataFrames and Datasets instead of RDDs. Mostly, I will focus on DataFrames and Datasets, because in Apache Spark 2.0, these two APIs are unified. Our primary motivation behind this unification is our quest to simplify Spark by limiting the number of concepts that you have to learn and by offering ways to process structured data. And through structure, Spark can offer higher-level abstraction and APIs as domain-specific language constructs. RDD was the primary user-facing API in Spark since its inception. At the core, an RDD is an immutable distributed collection of elements of your data, partitioned across nodes in your cluster that can be operated in parallel with a low-level API that offers transformations and actions. you can forgo some optimization and performance benefits available with DataFrames and Datasets for structured and semi-structured data. 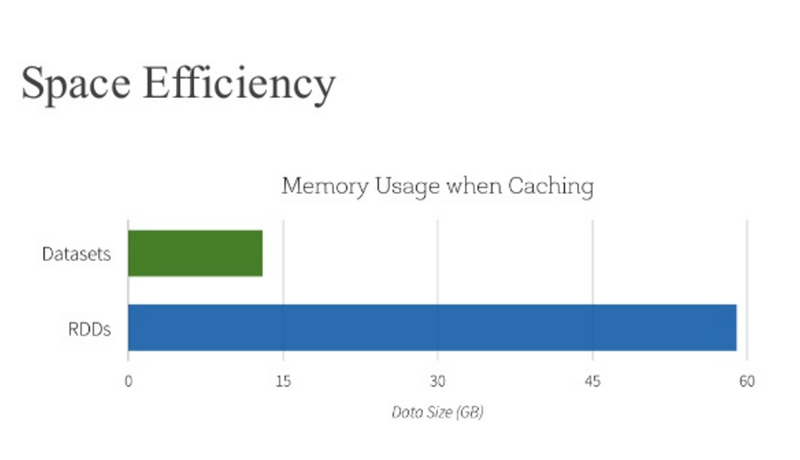 What happens to RDDs in Apache Spark 2.0? You may ask: Are RDDs being relegated as second class citizens? Are they being deprecated? What’s more, as you will note below, you can seamlessly move between DataFrame or Dataset and RDDs at will—by simple API method calls—and DataFrames and Datasets are built on top of RDDs. 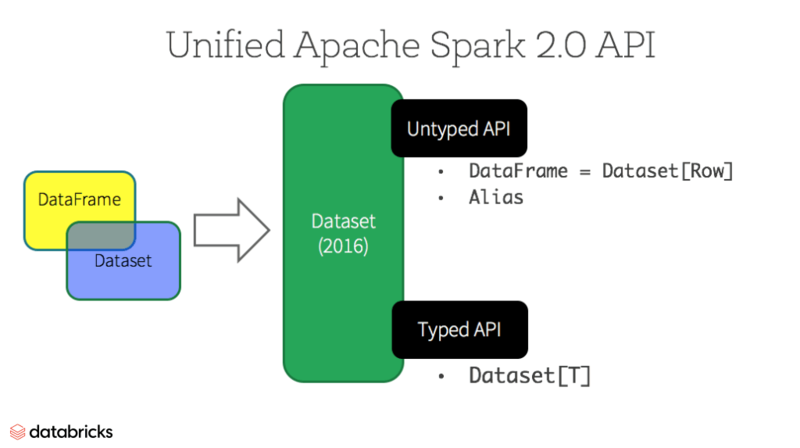 In our preview of Apache Spark 2.0 webinar and subsequent blog, we mentioned that in Spark 2.0, DataFrame APIs will merge with Datasets APIs, unifying data processing capabilities across libraries. Because of this unification, developers now have fewer concepts to learn or remember, and work with a single high-level and type-safe API called Dataset. Starting in Spark 2.0, Dataset takes on two distinct APIs characteristics: a strongly-typed API and an untyped API, as shown in the table below. Conceptually, consider DataFrame as an alias for a collection of generic objects Dataset[Row], where a Row is a generic untyped JVM object. Dataset, by contrast, is a collection of strongly-typed JVM objects, dictated by a case class you define in Scala or a class in Java. Note: Since Python and R have no compile-time type-safety, we only have untyped APIs, namely DataFrames. As a Spark developer, you benefit with the DataFrame and Dataset unified APIs in Spark 2.0 in a number of ways. Consider static-typing and runtime safety as a spectrum, with SQL least restrictive to Dataset most restrictive. For instance, in your Spark SQL string queries, you won’t know a syntax error until runtime (which could be costly), whereas in DataFrames and Datasets you can catch errors at compile time (which saves developer-time and costs). That is, if you invoke a function in DataFrame that is not part of the API, the compiler will catch it. However, it won’t detect a non-existing column name until runtime. At the far end of the spectrum is Dataset, most restrictive. Since Dataset APIs are all expressed as lambda functions and JVM typed objects, any mismatch of typed-parameters will be detected at compile time. Also, your analysis error can be detected at compile time too, when using Datasets, hence saving developer-time and costs. All this translates to is a spectrum of type-safety along syntax and analysis error in your Spark code, with Datasets as most restrictive yet productive for a developer. DataFrames as a collection of Datasets[Row] render a structured custom view into your semi-structured data. For instance, let’s say, you have a huge IoT device event dataset, expressed as JSON. Since JSON is a semi-structured format, it lends itself well to employing Dataset as a collection of strongly typed-specific Dataset[DeviceIoTData]. You could express each JSON entry as DeviceIoTData, a custom object, with a Scala case class. Next, we can read the data from a JSON file. Spark reads the JSON, infers the schema, and creates a collection of DataFrames. At this point, Spark converts your data into DataFrame = Dataset[Row], a collection of generic Row object, since it does not know the exact type. Now, Spark converts the Dataset[Row] -> Dataset[DeviceIoTData] type-specific Scala JVM object, as dictated by the class DeviceIoTData. Most of us have who work with structured data are accustomed to viewing and processing data in either columnar manner or accessing specific attributes within an object. With Dataset as a collection of Dataset[ElementType] typed objects, you seamlessly get both compile-time safety and custom view for strongly-typed JVM objects. And your resulting strongly-typed Dataset[T] from above code can be easily displayed or processed with high-level methods. Although structure may limit control in what your Spark program can do with data, it introduces rich semantics and an easy set of domain specific operations that can be expressed as high-level constructs. Most computations, however, can be accomplished with Dataset’s high-level APIs. For example, it’s much simpler to perform agg, select, sum, avg, map, filter, or groupBy operations by accessing a Dataset typed object’s DeviceIoTData than using RDD rows’ data fields. Expressing your computation in a domain specific API is far simpler and easier than with relation algebra type expressions (in RDDs). For instance, the code below will filter() and map() create another immutable Dataset. Along with all the above benefits, you cannot overlook the space efficiency and performance gains in using DataFrames and Dataset APIs for two reasons. First, because DataFrame and Dataset APIs are built on top of the Spark SQL engine, it uses Catalyst to generate an optimized logical and physical query plan. Across R, Java, Scala, or Python DataFrame/Dataset APIs, all relation type queries undergo the same code optimizer, providing the space and speed efficiency. Whereas the Dataset[T] typed API is optimized for data engineering tasks, the untyped Dataset[Row] (an alias of DataFrame) is even faster and suitable for interactive analysis. Second, since Spark as a compiler understands your Dataset type JVM object, it maps your type-specific JVM object to Tungsten’s internal memory representation using Encoders. As a result, Tungsten Encoders can efficiently serialize/deserialize JVM objects as well as generate compact bytecode that can execute at superior speeds. When should I use DataFrames or Datasets? If you want rich semantics, high-level abstractions, and domain specific APIs, use DataFrame or Dataset. If your processing demands high-level expressions, filters, maps, aggregation, averages, sum, SQL queries, columnar access and use of lambda functions on semi-structured data, use DataFrame or Dataset. If you want higher degree of type-safety at compile time, want typed JVM objects, take advantage of Catalyst optimization, and benefit from Tungsten’s efficient code generation, use Dataset. If you want unification and simplification of APIs across Spark Libraries, use DataFrame or Dataset. If you are a R user, use DataFrames. If you are a Python user, use DataFrames and resort back to RDDs if you need more control. In summation, the choice of when to use RDD or DataFrame and/or Dataset seems obvious. While the former offers you low-level functionality and control, the latter allows custom view and structure, offers high-level and domain specific operations, saves space, and executes at superior speeds. As we examined the lessons we learned from early releases of Spark—how to simplify Spark for developers, how to optimize and make it performant—we decided to elevate the low-level RDD APIs to a high-level abstraction as DataFrame and Dataset and to build this unified data abstraction across libraries atop Catalyst optimizer and Tungsten. Pick one—DataFrames and/or Dataset or RDDs APIs—that meets your needs and use-case, but I would not be surprised if you fall into the camp of most developers who work with structure and semi-structured data. You can try the Apache Spark 2.2 on Databricks and run this accompanying notebook. If you haven’t signed up yet, try Databricks now. In the coming weeks, we’ll have a series of blogs on Structured Streaming. Stay tuned.